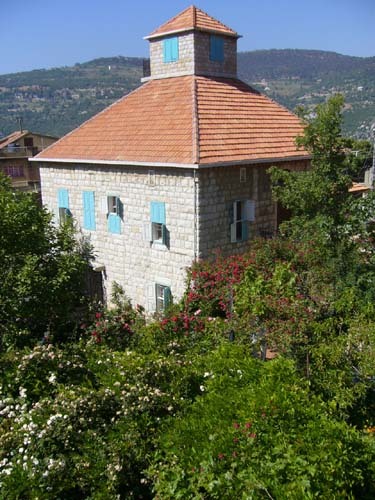 Yesterday, we went to the family house of a friend, up in the mountains near Bikfaya. He invited a group of people for a BBQ . There was a lot of confusion about how we would even get up there, and at the last moment, a small bus materialized and we all went up together. The house is truly amazing- 300 years old, built during the Ottoman period. Mike’s parents are slowly restoring it. It’s all stone, even the floors, aside from the wood ceilings. The gardens around it are sunny and lush, and we passed a very pleasant afternoon and evening, chatting and eating.